During the initial discussions it was determined that the “outages” were in fact PHP script errors, which in some server configurations are disabled by default, displaying a rather useless blank white screen instead. Whilst not immediately useful, it does at least provide some food for Google Recovery in order to begin a search for potential solutions. During this research phase, I actually turned up very little relating to Magento specifically, but there was quite a lot of information in relation to PHP. In many cases, a PHP module known as “APC” kept cropping up. APC (“Alternative PHP Cache”) is “a free and open opcode cache for PHP. Its goal is to provide a free, open, and robust framework for caching and optimizing PHP intermediate code.”. A quick check of server options using phpinfo(); confirmed that APC was indeed running on the server. I find the Magento’s cache system quite comprehensive, and set-up correctly should provide an adequate caching system/performance boost for your Magento site. If you have alternative thoughts or can offer more information on how APC can benefit a site, I’d welcome your comments. You can re-run phpinfo(); again to confirm the APC is disabled correctly – and of course, test the live site to see if it fixes your problem! There have been a real mix of comments regarding the disabling of APC as not really being a solution; I agree it’s definitely a last resort. In my case I was unable to resolve the issues by adjusting the configuration alone – so this I suggest you attempt to fix the error via configuration first (see comments below for suggestions) before resorting to disabling the APC. While I agree with your sentiment, the information in the post is still useful in some cases – say, someone who has a shop who can ill afford it to be offline for hours (even days) on end. It would also buy some time to correctly rectify the issue whilst keeping the shop online. I never said my “solution” was the be-all and end-all, it’s just a solution, and is intended to provide a reason for the error and one potential stop-gap solution. Thanks a lot, i have around 4000 users and very active forum, because of these stupid errors filling whole page was distracting my users, and i followed your instructions and Boom, errors are sweeped away…So thanks a lot.. I agree with K, this really isn’t a very useful post. As you say this is a stop-gap solution that ultimately slows down your system. A decent opcode cache such as APC does add a significant performance boost for minimal overhead, particularly for large complicated systems and should be used if possible. 1) Increase the size of the cache, we have the ram so this was an option for us. 2) Add a timeout so that stale cache entries are re-used. Thanks Sam. I did in fact try to override the PHP config with a local .ini, but the settings didn’t take effect, of course not all hosting solutions allow this. It’s great to have alternative potential solutions though – hopefully your comment will help someone out before they have to take more drastic steps! I also agree that disabling APC is not such a great plan, especially when the fix is pretty much as simple as increasing the apc.shm_size in the apc.ini file. (as per the StackOverflow thread). Hi mate, I trie to change the PHP but this doesn´t work….any suggestions? You will need to speak to your hosting provider if you are unable to override php.ini locally. Not all hosting solutions allow this. If you are running on a VPS or dedicated server you will have access to the root php.ini so should make changes there. “Please… this is not a solution, it’s ignorance” > the post you are refering to on stackoverflow is also false. Using a ttl of 0 will almost disable APC (all cached files deleted when it run out of memory). Disabling APC is not a solution APC is increasing efficiency of the computer it is environement-friendly. Just NOTE that you can put that directive in a given .htaccess file , so it is applied only for that folder. Specially usefl to disable APC on Piwik open source statistics. Thanks Bokan, your solution works for me. Not “ideal” but it does work. 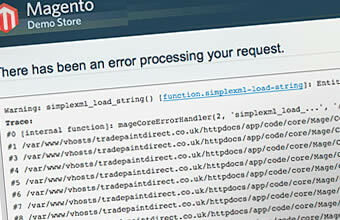 Thanks to sam, your advice seem to have solved our problems on magento (bitnami distribution for linux). My site was working on linux but i moved website to window server. it does not open . got this error “The server at mysite.com is taking too long to respond” and i checked system log it is logging this error. it is still looking for linux path on window platform. how can it be resolved ? any help would be greatly appreciated. i tried it and it actually works. Thanks , I have just bern looking for information about this subject for a long time and yours is thee greateest I have fkund out so far. However, what concerning the bottom line? Are youu certain concerning the source?